Homepage. This page: Interesting artefacts from Ford's Manchester factory in the 1940s during Aero engine production. In the years prior to WW2, the Ford Motor Company were well established at Trafford Park in Manchester, building iconic cars such as the Henry Ford's Model T ("tin lizzie"). A while back I purchased a box of old paperwork, and amongst it all were the items of paperwork shown below. They are well thumbed, and definitely used! I've put them up on the site because I've not come across items like this before, or since, and I hope they'll be of interest to people interested in the early days of Ford in the UK. When the war ramped up, and new aircraft types were being churned out as quickly as possible, it was decided that shadow factories would be used to construct Rolls-Royce Merlin aero engines, in order to keep up with demand. Shadow factories were already being employed in the build of aircraft fuselages, so it seemed logical to extend this to engine manufacture. As well as the increased production level of essential components and airframes, the use of shadow factories (ie factories converted to aero component manufacture that prior to the war were used for other uses) spread the risk of major disruption ensuing as a result of German bombing raids on the main factories. Ford installed a production line near their existing works at Trafford Park to handle the build of the Rolls-Royce Merlin engine, a powerplant that was used in many aircraft types, including the Avro Lancaster heavy bomber, and fighters such as the Hawker Hurricane and Supermarine Spitfire. The paperwork shown below dates to the wartime era, and belonged to a worker in the Manchester factory. After the war, Ford closed down their Trafford Park plant and concentrated their UK motor manufacture down in Dagenham, Essex. 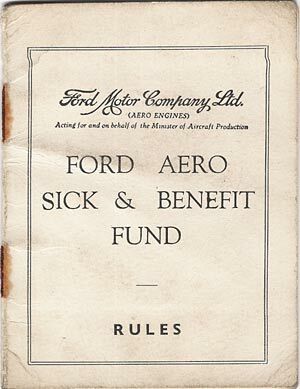 This little Ford Aero Sick & Benefit Fund handbook was issued by the Ford Motor Company Limited, ".. on behalf of the Minister of Aircraft Production". I've got 2 copies of this, slightly different style text on each. 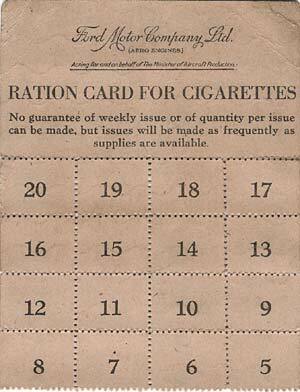 Ration Card for Cigarettes. I bet Ford no longer dish out cigarettes to the workforce! Again this dates to the war years - "No guarantee of weekly issue or of quantity per issue can be made, but issues will be made as frequently as supplies are available". 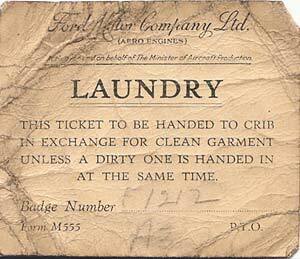 This battered piece of paper, a genuine Ford Laundry ticket, is extremely tatty, but there can't be many of these little laundry tickets around now. Again, this was issued acting on behalf of the MAP. 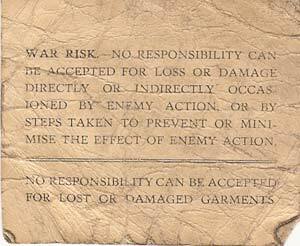 The rear of the Ford laundry ticket points out the War Risk - "No responsibility can be accepted for loss or damage directly or indirectly occasioned by enemy action, or by steps taken to prevent or minimise the effect of enemy action." A reminder that all factories supplying materials & goods for the war effort were under real threat from the Luftwaffe. 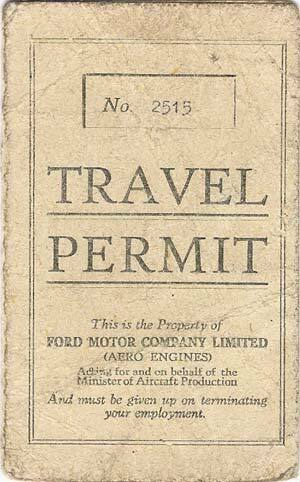 This Ford Travel Permit was issued to workers who wished to take advantage of the bus service. It would seem this gentleman didn't heed the instructions to return the permit once terminating employment with the company. Perhaps he stayed with Fords until their departure from Trafford Park altogether after the war. 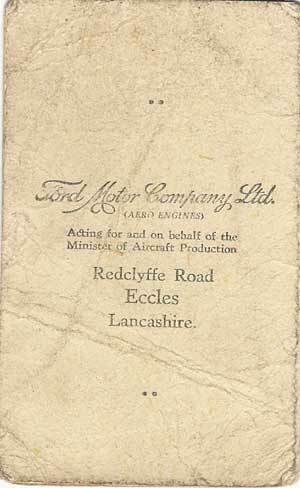 The address given for the aero engine factory was Redclyffe Road, Eccles, Manchester, which isn't far from Trafford Park. Shown above is the inside of the small travel card. 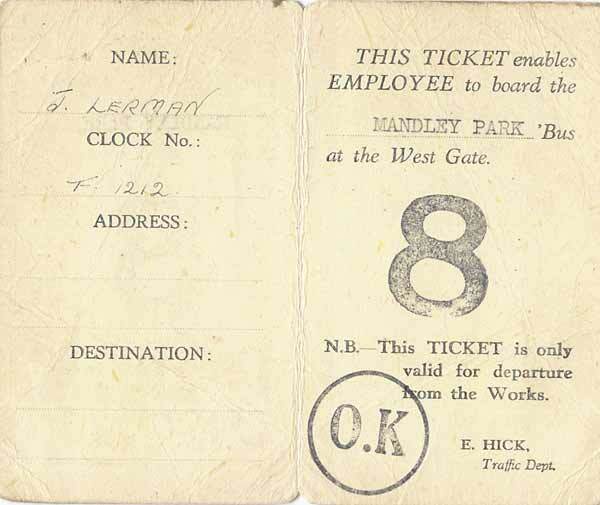 Mr Lehman had permission to board the Mandley Park bus, that departed from the West Gate. Interestingly the permit was only valid for home runs, as instructed by a Mr E. Hick, from the Traffic Department.